The Flying Eagle Cent and Indian Head Cent were minted between 1856 and 1909. We have a great selection of Indian Head and Flying Eagle Cents all graded using strict Photograde standards. Grades available from almost good in condition to almost uncirculated. Add some of these exciting, and rare U.S. Coins to your collection today. These coins offer great value to todays' collector making for a collection that can be easily, and affordably added to, and handed down for generations to come. - All details worn, but readable. - Feather details and eye are evident, but worn. - Feathers in right wing and tail show considerable detail. - Slight wear, all details sharp. - Slight wear on eagle's left wing and breast. Indian Head pennies, also known as the Indian Head Cent, were produced by the United States Mint and designed by Philadelphia Mint engraver James Barton Longacre from 1844 to 1869. 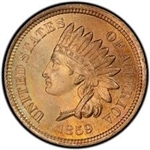 Indian Head coins are highly sought after due to their rarity, and collectors will often buy Indian Head pennies at many times their face value. Collectors in search of Indian Head Cents for sale will find that our selection is graded using strict Photograde standards, and spans across all production years. These coins feature the head of Liberty with a feather head dress of a Native American on the obverse side along with text reading “United States of America.” There will be one of two designs on the reverse side, depending on the year; a coin from 1859 reads "ONE CENT" inside a wreath of laurel, and the other, from 1860 until the end of production, has a similar design except that the text is inside a wreath of oak and olive. The reverse side also features a ribbon tied at the base of the wreath with a Federal shield above. Make the rare Indian Head Penny part of your collection while you can!